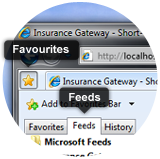 Please note the feeds below are for the Angola Gateway only. Below is a sample of the RSS Feed for the Angola Press Room. A financial instrument requiring fixed rand payments, such as a government or corporate bond.